In the treatment of renal disease, much of the diagnosis and treatment is carried out by the organization's own staff. There are occasions, however, when consultations and treatment external to the organization (e.g. X-rays, sonography diagnostics) are necessary. cyberREN automates the generation of requisitions for such external services and retains the requisitions as well as the results of consultations and procedures which are provided by external departments. 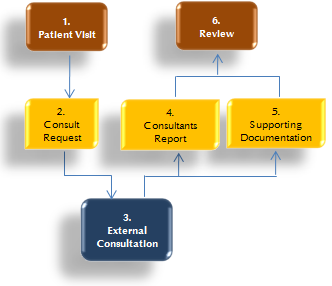 A request for an external service may be automatically generated by selecting the required clinical service from a catalog and generating a requisition based on a standard form letter, to which selected patient data (patient’s problem list, current medications, recent progress notes etc.) may automatically be appended. When the results are returned from the external consultant as a report or as an image, they may be scanned into the cyberREN system with the click of a button, making this report immediately available to all cyberREN users. A sample scanned image is presented below.